To create a successful direct mailpiece, at some point you may need to think like a machine—an automated mail-processing machine. That’s what will be “reading” your envelope or card for key information. Mistakes in design can mean your mail doesn’t qualify for automation discounts—or in the worst case, prevent your pieces from going through the mail at all. You want your mailpiece to look unique to catch customers’ attention, but an odd shape may not be the best way to do that. Certain shapes like squares and tubes are charged a higher price because those pieces must be processed manually. Such pieces are referred to as Customized Marketing Mail, or CMM. Speaking of odd shapes, don’t mail bulky, odd-shaped things like pens or bottle caps in regular letter-size envelopes. You’ll pay more in postage, and the items are likely to damage the envelope and be lost. A return address is required in some cases. For instance, you’ll need one if you’re asking the Postal Service™ to return mail to you that can’t be delivered, or if you’re paying with precanceled stamps or a company permit imprint. The return address always goes in the upper left corner of the address side of the mailpiece. For more details, refer to the Domestic Mail Manual (DMM) 202.0, Address Placement, and 602.1.0, Elements of Addressing. Postage, which can be paid with a stamp, meter, or permit imprint, goes in the top right corner. Information on the class of mail—for instance First-Class Mail®, Marketing Mail™, or Nonprofit—must be printed as part of, directly below, or to the left of the permit imprint, meter imprint, or stamp. For details on other options for price-specific markings, refer to the DMM 202.3.5, First-Class Mail and USPS Marketing Mail Markings. Endorsements are markings that tell the Postal Service what to do with mail if it can’t be delivered. For instance, you may want them to return it to you or provide you with address change information. For details on where endorsements can be placed, refer to DMM 202.4.0 Placement and Physical Standards for Endorsements. Barcodes contain a wealth of information that helps USPS® track and route mail more efficiently. To receive automation price breaks, your mailpieces must have a barcode. For details on barcode placement, see DMM 202.5.0, Barcode Placement Letters and Flats. Regulations can be confusing if you’re just starting out. To be sure your design will work, it’s a good idea to work with a Mailpiece Design Analyst (MDA). An MDA is a specially trained postal employee who can tell you if the finished piece will be mailable and suggest ways to make it eligible for the lowest possible postage rates. By carefully following these suggestions and working with an MDA, you can design a mailpiece that is cost-effective and, most importantly, reaches your prospective customers. What Is The Right Size For Your Direct Mailpiece? When you’re planning a direct mail campaign, one of your first decisions will be what size mailpiece to use. That decision will affect how much space you have for your message and how much you pay in postage. Take a look at the three most commonly used sizes for direct mail. Postcards are an inexpensive way to get an immediate message to customers—they don’t even have to open an envelope. First-Class Mail® postcards are a great value, too. You pay a lower price than for letters and get all of the benefits, such as forwarding and return services, that come with First-Class Mail service. However, when you send postcards via USPS Marketing Mail™ service (formerly called Standard Mail), there’s no price break. They cost the same as letters. If you use a standard No. 10 envelope, your piece is clearly a letter. But if you decide to create your own special envelope, or you design a piece to be folded to letter size, be sure to keep the letter dimensions in mind to avoid paying a higher price. 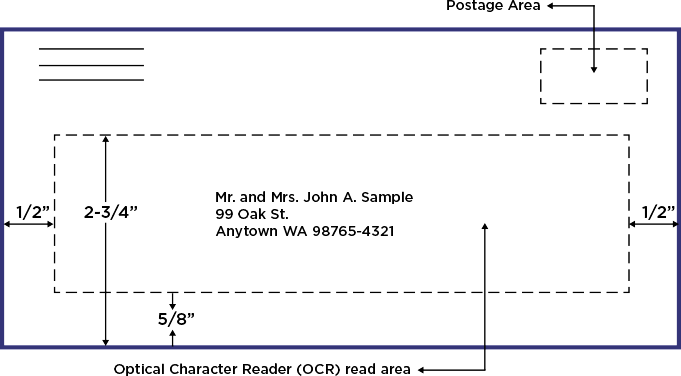 Letters can be mailed at First-Class Mail service or USPS Marketing Mail rates. Unlike postcards, they receive a price break when sent at Marketing Mail rates. Have one dimension that is greater than 11.5″ long OR 6.125″ wide OR 0.25″ thick. Can be no more than 15″ long x 12″ wide x 0.75″ thick. The Postal Service uses the word “flat” to refer to large envelopes, newsletters, and magazines. The maximum size for a flat provides plenty of room to put lots of material in the envelope. But keep in mind that weight usually affects price—the greater the weight, the higher the postage, especially for flats sent as First-Class Mail service. Choosing the right size to fit your budget and needs can help you save time and money in the long run.